With their ensemble Artemandoline, formed in 2001, Juan Carlos Muñoz and Mari Fe Pavón chose to go back to the original documents in order to the establish the true pedigree of this incomparable family of instruments. They have made a major contribution to launching a movement to encourage musical freshness and rigour. A better understanding of the compositions, closer study of the early treatises, the playing styles, the musical environment of the glorious era of the mandolin, leads to better appreciation of Baroque music, which itself became over time a mode of thought and action. The success of this approach based on a return to the sources, which constitutes the most important development in the history of the interpretation of ‘serious’ music in the course of the twentieth century, has been made possible by the cooperation of many protagonists – musicians, but also concert organisers, recording producers, publishers, musicologists, and instrument makers. Very quickly awarded prizes by the critics and enthusiastically acclaimed by the public, Artemandoline’s performances always create new impulsions. Its musicians dedicate their time and their talents to the revival of the mandolin on the musical scene, participating in the current expansion of interest in it all over the world through their conservatory teaching and masterclasses, their concerts, and their publications. Artemandoline is one of the pioneers in this domain, in which it has forged an international reputation. In a few short years, the ensemble has found its style, proved its instrumental quality, and thereby constituted a veritable identity. Soon after its formation, it took its place among the foremost ensembles in the realm of historical performance practice on plucked strings. Audiences and critics alike were immediately filled with enthusiasm for its lively musical style. 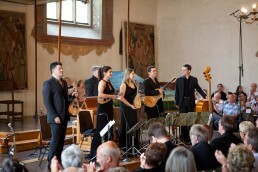 The musicians who make up the ensemble play on period instruments: Baroque mandolins, Renaissance and Baroque guitar, Baroque mandola and mandolone, Renaissance lute, treble lutes, mandolins from Brescia and Cremona.